Jim Egan was a very talented runner who had, for whatever reasons, a short career with big gaps therein. 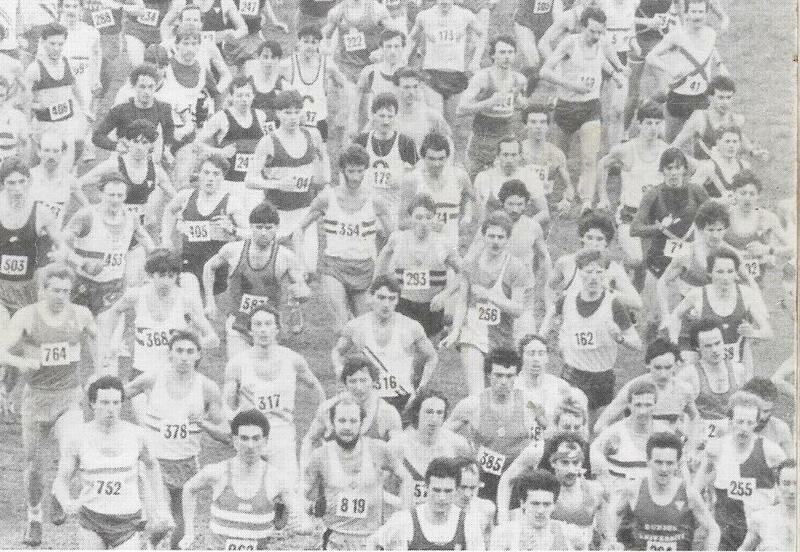 Where Emmet Farrell had a lot of excellent running in the ten years between his two Scottish championship victories, Jim won the Junior boys national in 1974 and was fifth in a very good field in the senior national in 1984, missed seven consecutive nationals in the gap. I’d really like to know more about Jim to find out what caused the big blank spaces that could have seen him continuing to battle out races with the likes of Graham Williamson and all his other contemporaries. Regardless of that, he had a genuine talent. Larkhall YMCA is a small club in Lanarkshire that produces many very good runners but which unfortunately suffers from the attractions and predations of other bigger county outfits. There were many who stayed and among them was Willie Morrison who won the SAAA 880 yards championship in 1960 in 1:54.8, and the Burns brothers, Willie and Ian, (Willie ran in the ICCU Junior Cross-Country in 1971 and 1972), the team which won the Scottish National Championship in 1970 (the brothers plus D McBain and J Sorbie). However Jim Egan is probably the best endurance runner that the club has produced. According to the club’s website, he started going along to the club in 1973 and, like almost all top class runners, it was clear even then that he was a talented athlete. On 19th January, 1974, less than a year after taking up the sport, he was second to Graham Williamson (Springburn) in the West District cross-country championship at Cleland. He followed this up a month later when he won the Scottish Under 13 national cross-country championship from Colin Hume (Teviotdale Harriers) and Graham Williamson (Springburn Harriers) at Coatbridge. He is still the only club member to win a national cross-country championship at any level. A pupil at Holycross High School, he was fourth in the 800m in 2:10.3 at Grangemouth on 25th May which was his best run of the summer, placing him 12th in the U15 age group. There was no sign of him in either District or National Cross Country Championships in 1975, 1976, 1977, 1978, 1979, 1980, 1981. He seems to have kept running because in 1977 he was recorded as running 2:02.2 for 800m on 28th June which placed him 15th in the Youths ranking lists. Like many a good athlete at the time, his career is not properly documented because of the poor coverage given to athletes out of the top three or four ta any age group, and particularly was this true of the younger age groups. Over the country it is easier since the entire field for cross-country championships is now online. Jim re-appeared in the results lists in season 1981-82: in the Western District Senior Cross Country Championships he finished a creditable 22nd ahead of some very good runners indeed but was absent from the national championship. He then disappears again and was unplaced in any of the championships (National, District or University) that summer, nor was he listed in the 1500m (down to 34th place), 3000m (to 15th) or 5000m (42nd) 82-83 no districts, no national. He returned to the national scene in 1982 when he was being coached jointly by Willie Mowbray and David John Nugent after working well in the 70’s with Alex Perrie who worked with many very good athletes from that area. From 1986 to the end of his career in the early 90’s he was coached by Tommy Boyle. Willie Mowbray tells me that Jim was a very good football player indeed, he actually describes it as his first love, and feels that that at least partly explains the long gap between his two best races. He goes on to say that Jim won the Scottish YMCA titlke several times and the British championship once in Manchester. These were of a high standard: although the many YMCA clubs of the pre-war years had dwindled in number, one only has to think of the runners produced by Motherwell YMCA in the 60’s and the fact that Bellshill YMCA produced Tom McKean, never mind the number of such clubs south of the border to realise that. Although Willie and David John always put the emphasis on quality work for Jim, there were the hard training miles to be done and for that you need company – John McFarlane and Sam Allison helped him get them done to. It was obviously a good combination for him. 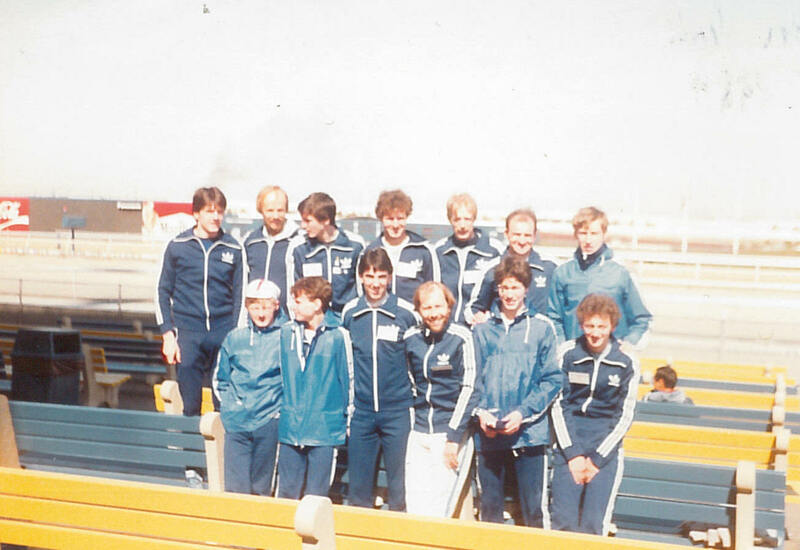 In his best cross-country season, 1983-84, Jim did not run in the district championships, although in November 1983 he was tenth in the Glasgow University Road Race, only three seconds behind Glen Stewart. His good form on the roads continued with a victory in the East Kilbride Road Race on 3rd December 1983 in 29:13. 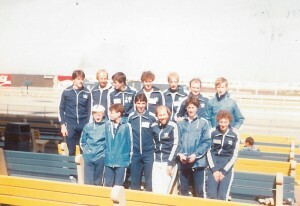 In January 84, he was third in the Nigel Barge behind Gordon Mitchell and Peter Fox, although it is fair to say that the field was a bit below par since the top ten from the previous year were running in invitation races abroad.. Jim had been running and racing at club level since 1982 and had set records for all the club road races. This was the year that he was fifth in the national. championships which were run on 25th February. The race was won by Nat Muit in 38:19. He was followed by Allister Hutton, Fraser Clyne, Ross Copestake and Jim Egan (39:39 – slightly less than 400 metres behind the winner) who was himself followed by Gordon Mitchell, Charlie Haskett, Lawrie Spence Alex Gilmour, Eddie Stewart and George Braidwood. It was a very good run indeed and an indication of just what Jim was capable of. He was of course selected for the ICCU International Championships which were held in New York that year and finished 170th. Remember when evaluating this position however that, as one of the others said before the race, “There were 40 countries running tomorrow. Every country has a runner like Nat Muir and a runner like Allister Hutton. So that’s 80 places you can forget about.” And then factor in the African element …. Jim was new to top class international running and it was not a bad run by any means. The following summer, he had a best 1500m time of 3:49.06 which placed him 14th in the ranking lists for that season..
And the trail goes cold at that point. Looking at his career from the few statistics generally available, he could probably have done much more. Like several other clubs, L:arkhall YMCA did not often enter teams in too many District relays or championships, an like almost all clubs in the land did not have teams in the Edinburgh to Glashow relay where Jim could probably have done well. No doubt he was approached by or even on occasion attracted to other local clubs and it is to his credit that he stayed with his original local club. He did not however seem to race in the many open races around the central belt that could have helped his development and that puzzles me a bit. He may of course have been injury prone and missed a season or two with a chronic injury. It is possible though, that like many another boy who displays precocious talent early on, he drifted away to some other sport for a couple of years – football and rugby are the usual culprits. In Jim’s case it was football. One thing is certain though – Scottish athletics could have done with a few more years of a fit Jim Egan.